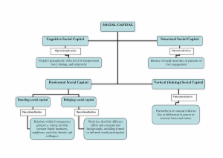 The aim of the paper is to critically review the notion of social capital and review empirical literature on the association between social capital and health across countries. The methodology used for the review includes a systematic search on electronic databases for peer-reviewed published literature. We categorize studies according to level of analysis (single and multilevel) and examine whether studies reveal a significant health impact of individual and area level social capital. We compare the study conclusions according to the country's degrees of economic egalitarianism. Regardless of study design, our findings indicate that a positive association (fixed effect) exists between social capital and better health irrespective of countries degree of egalitarianism. However, we find that the between-area variance (random effect) in health tends to be lower in more egalitarian countries than in less egalitarian countries. Our tentative conclusion is that an association between social capital and health at the individual level is robust with respect to the degree of egalitarianism within a country. Area level or contextual social capital may be less salient in egalitarian countries in explaining health differences across places. Copyright statement: Copyright © 2006 Islam et al; licensee BioMed Central Ltd.